Alfred Thomas Lyndell Gregory was born in Yeovil in 1899, the son of leather parer Lyndall Gregory and glove tambourer Mary Maria née Brown. Lyndall and Mary were to have five daughters as well as Alfred: Corrie (b1883), Ada (b1885), Ethel (b1890, Annie (b1891), Rosa (b1894) and Alfred. In the 1901 census the family were listed in Orchard Street together with Mary's mother, Mary Brown and a niece, Alice Little. In the 1911 census the family were still living at 26 Orchard Street and 12-year old Alfred was listed as a scholar. It is known that Alfred enlisted at Yeovil and this was probably the middle, or towards the end, of 1917 when he turned 18. He joined the 2nd Battalion, Oxford & Bucks Light Infantry. His Service Number was 34779. Battle of St Quentin (21-23 March 1918) and the First Battle of Bapaume (24-25 March 1918), both were phases of the First Battles of the Somme 1918. The Battle of St Quentin began the German's Spring Offensive on 21 March 1918. It was launched from the Hindenburg Line, in the vicinity of Saint-Quentin, France. Its goal was to break through the Allied lines and advance in a north-westerly direction to seize the Channel ports, which supplied the British Expeditionary Force (BEF) and to drive the BEF into the sea. Two days later General Ludendorff, the Chief of the German General Staff, changed his plan and pushed for an offensive due west, along the whole of the British front north of the River Somme. This was designed to separate the French and British Armies and crush the British forces by pushing them into the sea. The offensive ended at Villers-Bretonneux, to the east of the Allied communications centre at Amiens, where the Allies managed to halt the German advance; the German Armies had suffered many casualties and were unable to maintain supplies to the advancing troops. Much of the ground fought over was the wilderness left by the Battle of the Somme in 1916. The action was therefore officially named by the British Battles Nomenclature Committee as The First Battles of the Somme, 1918. The following day, the battalion was involved in the First Battle of Bapaume. In the late evening of 24 March, after enduring unceasing shelling, Bapaume was evacuated and then occupied by German forces on the following day. After three days the infantry was exhausted and the advance bogged down, as it became increasingly difficult to move artillery and supplies over the Somme battlefield of 1916 and the wasteland of the 1917 German retreat to the Hindenburg Line. On 25th the troops were ordered to withdraw and reorganise. The 2nd Battalion next saw action on the Somme, taking part in the First Battle of Arras (28 March 1918) which was the beginning of the Offensive in Picardy. Following this, the intensity of fighting lessened somewhat although the landscape remained extremely dangerous and day-to-day fighting took a tremendous toll on both sides. The 2nd Battalion was next involved in the Battle of Albert. The Battle of Albert, fought from 21 to 23 August 1918, was the third battle by that name fought during the Great War. This smaller third battle was significant in that it was the opening push that would lead to the Second Battle of the Somme. This attack opened the advance, with the main attack being launched by the Third Army along with support from the Fourth Army. Within a couple of weeks Alfred was in action again. The Battle of Havrincourt was fought on 12 September 1918, involving the British Third Army against German troops, in the town of Havrincourt, France. Although the battle was relatively small, it marked the first time that the Hindenberg Line was pierced. This was the beginning of a turning point in the war, it was noted how the Germans had given up their position relatively easily. It highlighted the lack of fighting spirit amongst the German army at this stage in the war. Again, after a couple of weeks rest, Alfred's battalion was in action again. The Battle of Canal du Nord, fought between 27 September and 1 October 1918, was part of a general Allied offensive against German positions on the Western Front during the Hundred Days Offensive of World War I. The battle took place in the Nord-Pas-de-Calais region of France, along an incomplete portion of the Canal du Nord and on the outskirts of Cambrai. To avoid the risk of having extensive German reserves massed against a single Allied attack, the assault along the Canal du Nord was undertaken as part of a number of closely sequenced Allied attacks at separate points along the Western Front. Alfred was killed in action on the final day of the Battle of Canal du Nord, 1 October 1918 and was interred in Anneux British Cemetery - Grave B.14. Alfred, just 19 years old, was just one of 34 soldiers of his battalion who fell this day, most are buried in a single grave in Anneux British Cemetery. Alfred's name is inscribed on the War Memorial in the Borough. 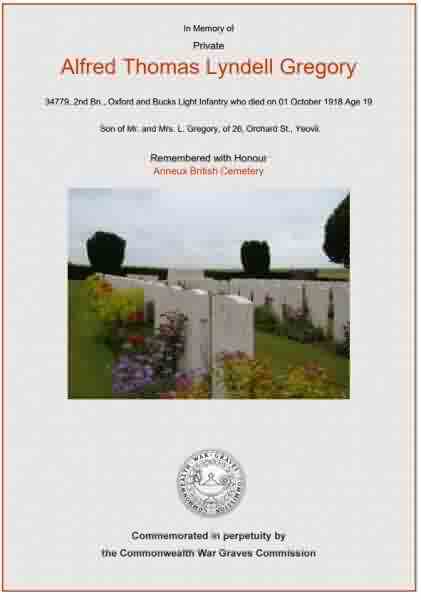 The Commonwealth War Graves Commission certificate in memory of Alfred Gregory. 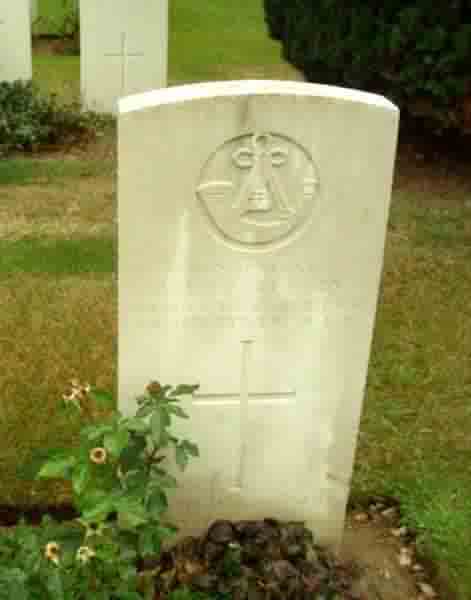 The Commonwealth War Graves Commission headstone in memory of Alfred Gregory.